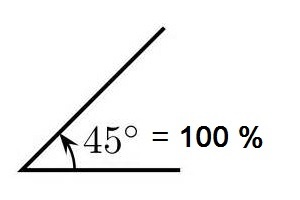 Convert the degrees of an angle to percentage of slope with this online calculator. Input the degrees of an angle to convert to percentage of slope. or greater. The percentage approaches infinity as you near 90 degrees. How do you convert degrees to percent? the rise is greater than the amount of run by 11.06 percent.